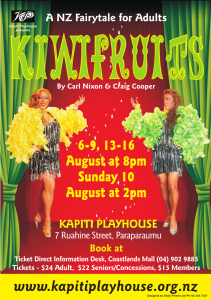 Kiwifruits coming this August - Kapiti Playhouse Inc.
Kapiti Playhouse is pleased to announce that rehearsals are well under-way for their second production of 2014, Kiwifruits by Carl Nixon and Craig Cooper. Liz Alpine directs this hilarious free-wheeling Kiwi version of the Cinderella story in which Fay Gay tells fellow performer Tatania the story of how the Castle Road Tavern was saved from ruin by being transformed from a traditional working men’s pub into a venue for spectacular drag shows. Featuring a wicked lawyer, glamorous gowns, delicious dancing and a fairy godmother unlike any you’ve ever seen before, this show is sure to be one of the funniest, if not the funniest, plays to grace the stage in the past few years. 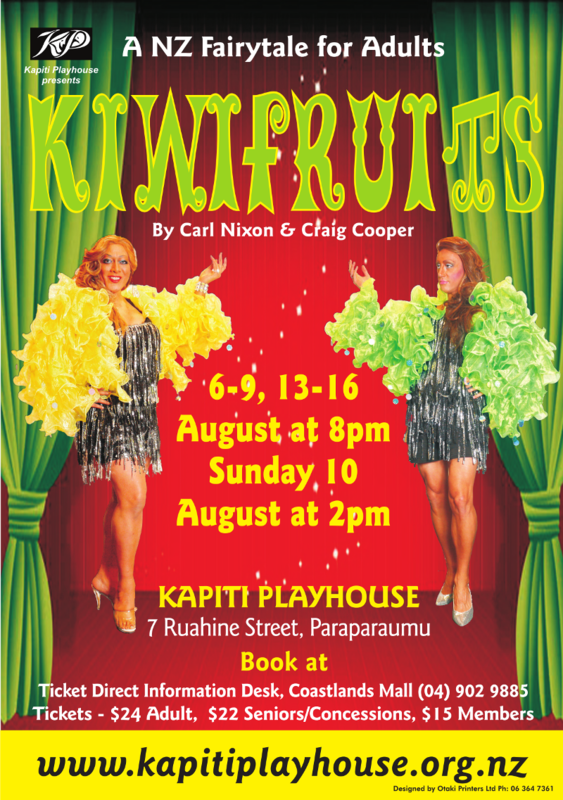 Tickets for Kiwifruits will be Adults $24, Seniors / Group Bookings (8+) $22, and Members $15. More information and booking details will be added over the next couple of weeks so be sure to keep an eye out on the website and our Facebook page.